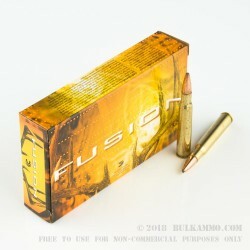 The Fusion line by Federal Ammunition is a groundbreaking line of affordable premium ammunition that offers significant innovation in an otherwise plain vanilla cartridge. The innovation is subtle but effective. 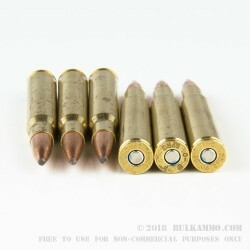 It starts with and is mostly centered around the projectile which has a fused copper jacket that has been electrochemically applied to the lead core and has a skived tip that helps to promote and control expansion at the tip of the bullet at impact. The bonded jacket is so well bonded that the weight retention is significantly higher than even the best mechanically bonded bullets. It approaches the best monolithic bullets and, in some cases, can even beat them. 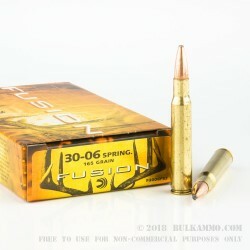 It is this high weight retention that makes this such an effective big game bullet. The controlled expansion/deformation and the lack of weight loss makes it deliver all of its energy in a single place and the penetration and wound channel are directly affected in a positive way for the hunter by this engineering. 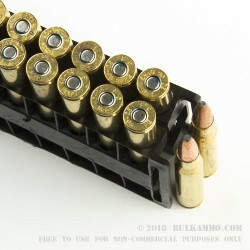 The clean powders that back the copper bonded projectile (which resembles a soft point) allows for faster follow up shots due to smoke mitigation and the Boxer primed brass makes it reloadable easily.